Funky introducing himself to Donkey Kong and Diddy. This article is about Funky Kong's location in Donkey Kong Country. For the mini-game in the Game Boy Advance remake of Donkey Kong Country 2, see Funky's Flights (Bonus Game). Funky's Flights is a travel service operated by Funky Kong in Donkey Kong Country and DK: Jungle Climber. Its main purpose to transport the Kongs to a previously-visited location. Funky operates a Funky's Flights in every world of Donkey Kong Country. It is Donkey Kong and Diddy Kong's only alternative to accessing a previously-visited world and level without defeating a boss. When the Kongs enter Funky's Flights, Funky lends them his Jumbo Barrel, which transports them to the Donkey Kong Island map. While Funky still hosts his flight service in the Game Boy Advance remake, he also hosts a new mini-game, Funky's Fishing. As a result, the location was renamed to "Funky's Fishing" on the world map. 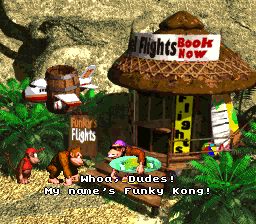 While the Kongs can visit Funky to use the Jumbo Barrel, this is not necessary because the player has another convenient option, by using the world map's new menu, and selecting the option "Call Funky". Funky's Flights has a successor location in Donkey Kong Country 2: Diddy's Kong Quest and Donkey Kong Land 2, named Funky's Flights II, although in Donkey Kong Land 2, the location shared the same name as its predecessor, Funky's Flights. Funky's Flights II has a similar role to its original counterpart, with the biggest difference being that Funky Kong charges Diddy and Dixie two Banana Bunch Coins the second time they use his location from a world. Concept art of Funky's Fly 'n' Buy in Donkey Kong Country: Tropical Freeze shows it with the title "Funky's Flights" displayed on its tent. In the Donkey Kong Country animated series, Funky's Flights was located near the beach and docks of Kongo Bongo Island and had a complex system built into that could raise the entire hut into the air and suspend it there. On the show, Funky's Flights, as well as offering plane rides to people, made deliveries for Bluster's Barrel Works as well. The inside of Funky's Flights was also shown on occasion on the show and was filled with surfer memorabilia along with common household objects such as a couch, refrigerator and paintings. In "Hunka Hunka Burnin' Bluster", Funky says he wants to transform Funky's Flights into a restaurant. Funky operates a similar flight service to Funky's Flights in DK: Jungle Climber, named Funky's Airplane. The player can visit him by pressing from the world map. 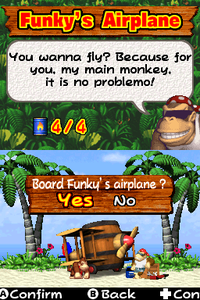 Funky's Airplane has a slightly different role than Funky's previous two flight services, as its intention is to fly DK and Diddy to the small, outer island of the current world. However, the Kongs are required to have a minimum number of Oil Barrels, which varies per world, to fuel Funky's airplane. In Super Smash Bros. Ultimate, Funky's Flights makes a cameo appearance in the DK Island subarea of the World of Light, which in itself is a recreation of the Kongo Jungle world map from Donkey Kong Country. Funky Kong's spirit is fought here and, after defeating it, unlocks Funky Kong's Shack, one of the shops in Spirits mode. Additionally, Funky's Flights' background music, "Funky's Fugue," appears as a song in the game, including in Funky Kong's Shack. "Funky's Flights are the only way to fly! However, Funky's practices have changed, and he has different plans for you this time out." The theme for Funky's Flights was originally composed for another Rare game, Killer Instinct. "Bad Hair Day" • "Ape Foo Young" • "Booty and the Beast" • "Barrel, Barrel... Who's Got the Barrel" • "Kong for a Day" • "Raiders of the Lost Banana" • "From Zero to Hero" • "Buried Treasure" • "Cranky's Tickle Tonic" • "Get a Life, Don't Save One" • "Orangutango" • "Double Date Trouble" • "The Curse of Kongo Bongo"
"Speed" • "Klump's Lumps" • "Bluster's Sale Ape-Stravaganza" • "Legend of the Crystal Coconut" • "Kong Fu" • "I Spy with My Hairy Eye" • "Bug a Boogie" • "Watch the Skies" • "Baby Kong Blues" • "Ape-Nesia" • "The Big Chill Out" • "To the Moon Baboon" • "A Thin Line Between Love & Ape"
"Hooray for Holly-Kongo Bongo" • "The Kongo Bongo Festival of Lights" • "Speak No Evil, Dude" • "The Day the Island Stood Still" • "Monkey Seer, Monkey Do" • "Four Weddings and a Coconut" • "Follow That Coconut" • "Vote of Kong-Fidence" • "The Big Switch-A-Roo" • "Hunka Hunka Burnin' Bluster" • "Best of Enemies" • "It's a Wonderful Life" • "Just Kidding" • "Message in a Bottle Show"
"Les boeufs de l'amour" • "Bouffy contre les vampires" • "La chanson aux chaussons" • "Caspied le gentil fantôme" • "C'est pas sorcier" • "Le comte de Monte Costaud" • "Fréquence Kong" • "La nuit des vivants-morts" • "Obel Corsica" • "Remix Files" • "Royal Calin" • "Toc Story 2"
This page was last edited on March 2, 2019, at 00:17.